Comments were also made that people who work in offices may not fully appreciate the workingenvironments which road crews may encounter on arrival at scene. For example, the hazards which are encountered by crews attending to a patient who is sat on a park bench may be considered rather low, but when crews are working close to fast flowing, dark tidal waters, the number of hazardsincreases exponentially. If EOC are able to establish from the caller that the patient was on a houseboat, riverboat, yacht, narrowboat or injured on a slipway, towpath or riverbank and was in need of medical assistance, then because the responding ambulance crew would be at risk of working close to water, EOC will ensure that the nearest HM Coastguard Centre is alerted. The HMC has the delegated responsibility for the coordination of maritime incidents in specific inland areas which include Norfolk and Suffolk Broads; and River Thames to Teddington Lock. This is explained fully in the EOC Instruction EI 052 issued on 31 July 2017. This might not be expected however if a patient had fallen into a river, subsequently been rescued by Joe Public and was now sat in a pub wrapped in blankets in front of the log fire; after all, the river is no longer presenting a risk to the patient or crew. HMC may still need to be made aware if the location is remote and difficult to reach by road. There have been many instances where HMC involvement has resulted in a successful outcome but that success relies upon them being notified at the earliest opportunity and being kept up to date with on scene developments. 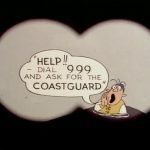 It was 50 years ago that the HM Coastguard introduced the world (or at least the United Kingdom) to Joe and Petunia; the unassuming couple who heralded the campaign to “Dial 999 and Ask For The Coastguard” for anyone in danger in the water. The same ethos applies today. When crews approach the scene, it is expected that they would carry out a dynamic risk assessment, taking in all the features, obstacles, people, terrain and visible hazards; not blindly rushing in where angels fear to tread. If, on arrival there are no other resources on scene and there has been no additional information provided to them on route, the crew should contact ICD on channel 1 to provide a situation update specifically identifying the risk of working near to water. The risk assessmentgained on a warm sunny afternoon might be very different from 6 months later when winter sets in and daylight reduces around mid-afternoon. Canal towpaths can become overgrown by moss and weeds making it slippery, gently sloping village greens can become sheets of ice sending all and sundry headlong towards the ice-covered pond. 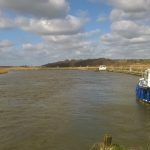 Spring tides have the lowest low tides and this can leave moored vessels lower down below the quayside or aground in the mud. 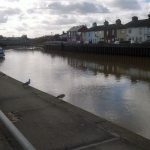 Likewise, the spring tides are the highest high tides and this can result in river banks overflowing, tow paths becoming flooded and vessels can be floating partially over the riverbank. When the tides subside, these vessels are at risk of toppling over. The view here is very relaxing, but the incoming flood tide has already covered the towpath beneath the road bridge to the left. There are plenty of overnight moorings for over half a mile either side of the bridge, on both riverbanks; but the wet slippery grassy banks with no illuminations and hundreds of small strong mooring posts create trip hazards. It’s a long walk with all the additional equipment “just in case it is needed”. (Memo to self: Ensure that the HM Coastguard are alerted; after all, they have the resources & manpower, to get us with all our kit to and from the patient safely). The water may look calm and the approach may look safe, but uneven ground can cause a person to stumble; If you fell into the water, would you be able to jettison that response bag from your back before you went under? Have you ever tried swimming or treading water while fully clothed? It’s not easy. Better to stay clear of the water. Even better to learn how to swim and to survive in water. Local knowledge is invaluable but our service covers 7,500 square miles and ambulance crews no longer work solely in their own town location. We can be assigned to calls anywhere within our region and that means we rely upon Sat-Nav to guide us to our patients. We need to be aware of the changing topography; we need to look at the MDT or local map books to see what the ground is like in the area we are going to. We should contact ICD on channel 1 if we Identify that access to the patient may be limited or denied due to narrow roads, dirt tracks or across open fields; and also if the patient appears to be close to or on water. Does the address suggest a boat name? 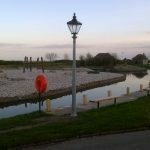 On arrival we may find poorly maintained moorings and accessways with additional hazards and these may include broken mooring posts, excess vegetation, lack of illumination, absence of safety rails and no Life Buoys or Throwing Lines. We need to be alert to these hazards and consider how these hazards way impact on taking the patient to hospital. It would take a co-ordinated effort to extricate a patient from a vessel moored alongside here, and the steep narrow steps would hamper progress. 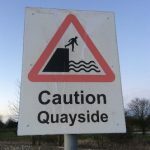 If we encounter safety railings they should act as a warning; although at this location there is a concrete towpath, it is a long fall down to the fast-flowing waters below. 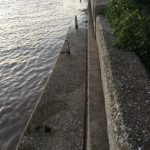 In many areas it is common practice for vessels to be moored two a breast which increases the number of mooring lines stretched across the gaps to the mooring posts and the patient may be on the vessel furthest from the shore. My experiences in the Royal Air Force Fire Service as a Coxswain and recreationally afloat on cruisers and yachts taught me that unless I was below deck or ashore, the safest and best practice was to always wear my life jacket. It is this experience which has been the driver to ensure that crews who are sent to waterside locations are provided with the appropriate PPE: lifejackets. Following the merger of services, they were removed from ambulances which had previously carried them. A decision which did not and still does not sit well with me today. 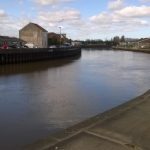 The matter has been raised on numerous occasions via the Trust Health & Safety Committee and although no employees have drowned while responding to patients that are on vessels or water side, a number of clinicians have made contact with Unison Health & Safety. 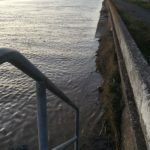 They have lodged their concerns because being close to deep, fast flowing water has had a negative impact on them and was a major distraction on scene. They were disappointed that the life jackets had been removed from their ambulances and whilst they felt safer wearing them, they had no desires or intentions of using them to aid the rescue of anyone that was actually in water. This has led to a number of visits to waterside locations to carry out on-site risk assessments. 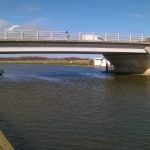 On Monday 18 March 2019, I met with David Sexby (Ipswich), David Whitehouse (Trust Health & Safety) and Simon Galloway (North Essex) at three separate waterside locations. The purpose of the meetings was to assess the levels of risk that the different locations presented and to establish the course of action which ambulance crews should follow if they found themselves in similar locations. The subject of life jackets was discussed at length and it was noted that the overall purchasing, training and annual servicing costs would make it very expensive to include lifejackets in the ambulance loading lists. The additional resources available to support ambulance crews who may find themselves working near water include our own H.A.R.T. as well as HM Coastguard, River Authority Launches, Police Launches, Fire Service Water Rescue Teams, RNLI Lifeboats and Inshore Rescue Craft plus a number of volunteer groups who operate inshore rescue craft and lowland rescue teams. 1. The Trust needs to review its SOP for deploying staff to patients in close proximity to areas of water and ensure that all operational staff are made aware of it. 6. Where possible and practical, the patient should be encouraged to move away from the waterside or leave the vessel to reduce the risk of further casualties. Remember: Scene Safety. Life is precious.